There are eight performance units for the NVQ 2357, units 311 to 313 and 315 to 318. The eighth unit is unit 399, commonly known as the AM2 which must be taken at an approved AM2 Centre. (This is arranged for you on our Silver & Gold Packages – see below). The eight performance units of the NVQ are outlined below. The first seven of these units (311 -313 and 315-318) must be carried out in your place of work where evidence is collected by your assessor via remote on-site assessment and by the candidate by creating site diaries within the e-Portfolio. All outcomes for these seven units must be covered on at least two occasions. The Silver Package is our most popular option because it includes the AM2, which is compulsory at the end of your course to complete your NVQ. Simply click on one of the Packages and Payment Options just below to get started on your NVQ right now. More details of the units within this course are printed below the NVQ 2357 Level 3 Diploma package options. This unit is designed to enable learners to develop the skills and apply the relevant knowledge associated with Health and Safety legislation, practices and procedures when installing and maintaining electrotechnical systems and equipment. Apply procedures to deal with and report Health and Safety in accordance with Health and Safety legislation. Supply information on environmental technology systems in the work location. This unit is designed to enable the learner to develop the skills required, and apply the associated knowledge, in order that they are able to demonstrate they can implement practices and procedures for overseeing and organising the work environment for the installation of electrotechnical systems and equipment. Organise the resource requirements for work on electrical systems and equipment. Confirm any variations to the installation specification or planned programme of work. Confirm that terminations and connections are safe and free from defects in accordance with statutory and non statutory regulations. Commission electrotechnical systems and equipment. Correct faults on electrical systems and equipment. What if you have already achieved City & Guilds 2330 Level 2 and Level 3? If you have already achieved the City & Guilds 2330 Level 2 and 2330 Level 3 (or EAL equivalent) then your certificates map over to only eight of the nine knowledge units of the NVQ 2357. You will need to complete unit 602 (formerly unit 302) Understanding environmental legislation, working practices & the principles of environmental technology systems (ELTK 02). The unit 602 assessments include one evolve on-line test (exam conditions at a centre) and one short assignment task focused on photovoltaic (PV) installation work. What if you have already achieved City & Guilds 2330 Level 2 or 2365 Level 2 and 2365 Level 3? If you have already achieved City & Guilds 2330 Level 2 or 2365 Level 2 and 2365 Level 3 then you will need to complete the “bridging assessment” covering units 603 and 605 (formerly units 303 and 305). However, if you achieved the 2365 Level 2 & 3 qualifications after September 2017, the bridging unit is not required. Unit 601: Understanding Health and Safety legislation, practices & procedures (installing & maintaining electrotechnical systems & equipment) (ELTK 01). City & Guilds 2365 Level 2 or 2330 Level 2 covers the knowledge criteria for this unit. Unit 602: Understanding environmental legislation, working practices & the principles of environmental technology systems (ELTK 02). If you have already achieved 2330 Level 2 & 2330 Level 3 then you will need to complete this knowledge unit and all the performance units. Unit 603: Understanding the practices & procedures for overseeing & organising the work environment (Electrical Installation) (ELTK03). See unit 605 below. Unit 604: Understanding the principles of planning & selection for the installation of electrotechnical equipment & systems in buildings, structures & the environment (ELTK04a). City & Guilds 2365/2330 Level 2 and 2365/2330 Level 3 covers the knowledge criteria for this unit. Unit 605: Understanding the practices and procedures for the preparation & installation of wiring systems & electrotechnical equipment in buildings, structures & the environment (ELTK04). If you have already achieved 2330 Level 2 or 2365 Level 2 and 2365 Level 3 then you will need to complete “bridging assessment” covering units 603 and 605 and all the performance units. Unit 606: Understanding the principles, practices & legislation for the termination & connection of conductors, cables & cords in electrical systems (ELTK05). City & Guilds 2365/2330 Level 2 and 2365/2330 Level 3 covers the knowledge criteria for this unit. Unit 607: Understanding principles, practices & legislation for the inspection, testing, commissioning & certification of electrotechnical systems & equipment in buildings, structures and & environment (ELTK06). City & Guilds 2365/2330 Level 2 and 2365/2330 Level 3 covers the knowledge criteria for this unit. Unit 608: Understanding the principles, practices & legislation for diagnosing & correcting electrical faults in electrotechnical systems & equipment in buildings, structures & the environment (ELTK07). City & Guilds 2365/2330 Level 2 and 2365/2330 Level 3 covers the knowledge criteria for this unit. Unit 609: Understanding the electrical principles associated with the design, building, installation & maintenance of electrical equipment & systems (ELTK08). City & Guilds 2365/2330 Level 2 and 2365/2330 Level 3 covers the knowledge criteria for this unit. 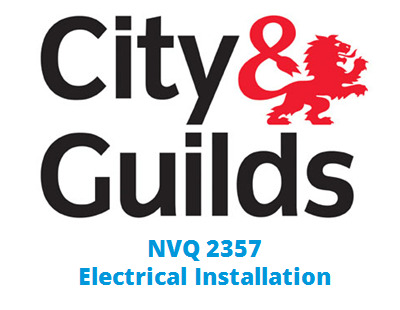 Start Your NVQ 2357 in Electrical Installation NOW!